Last day i had installed mozilla firefox in my desktop. than my desktop running slow. than i uninstalled mozilla firefox but still now desktop running slow. i think i have got virus. so what can i do now? Back from my holiday. Was brilliant. 50 degrees in Qatar. 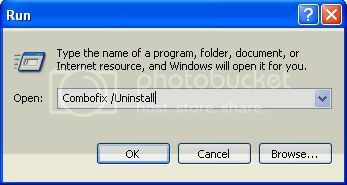 You have the recommended Java installed (1.7.0_06). It's fine. It doesn't slow at all. Just want to say thanks. Anyway, do I still need JavaRa and other things? Yes, you need to keep all your programs updated. Malware just love out-of-date programs, especially Java. It says "Windows cannot find Combofix". I'm sure I'm trying it correctly. I could have already been removed. Look in your Control Panel, Programs, Programs and Features and see if it's there. You can also check on your C drive to see if anything is left of ComboFix there. To set a new Restore Point. Click Start button , click Control Panel, click System and Maintenance, and then clicking System. In the left pane, click System Protection. If you are prompted for an administrator password or confirmation, type the password or provide confirmation. To turn off System Protection for a hard disk, clear the check box next to the disk, and then click OK. Reboot to Normal Mode. Click the Start button , click Control Panel, click System and Maintenance, and then click System. This will give you a new, clean Restore Point. Right. OTL was weird. It showed the desktop like it said, although I didn't actually see the program. I only saw a black outline of where it should be. This was what was happening for about two minutes, then my computer restarted. Logging on, I noticed two files called "desktop.ini" on my desktop. Is this all meant to happen? What were you trying to do with OTL? Sorry, not OTL, I meant TFC. Dunno why I said that. Ran it again and this time I managed to see some of what it was doing. It was saying 0 bytes cleared for everything so it had probably worked the first time. Still confused about the desktop.ini files. What do I do with them? Desktop.ini is a Windows XP system file that stores information about customized folders. If you have customized the display of a folder in any way, such as changing its icon or manner of display, Windows has saved those settings in a desktop.ini file. In the following screenshot, I have right-clicked on a folder and am about to customize it. Since Desktop.ini is a Windows system file, you are probably seeing it because you have set Explorer to display hidden/system files. By reversing this setting, you can get rid of Desktop.ini. 3.Check off the radio button next to “Do not show hidden files and folders”. 4.Put a check in the box next to “Hide protected operating system files (recommended)”. Once you have made these changes, Desktop.ini should be out of sight and out of mind. Here is a screen shot of the same folder from Figure 1. It’s still customized, but Desktop.ini is nowhere to be seen. Okay, thanks very much SuperDave. The desktop.ini isn't showing anymore. Set a new restore point and all is well. Thanks again. Just out of curiosity was there much wrong with my computer?